As I’m thinking ahead to this weekend’s Organize-athon, my head is spinning with excitement! There are so many things I could do this weekend to make my home a notch tidier and more functional for myself and my family, and that makes me almost giddy. I know, however, that I’ll be even more excited with the results of this weekend’s organizing efforts if I do a little pre-planning ahead of time. Whether you plan to join me for the Organize-athon (I sure hope you do!) or not, next time you plan to clear your calendar for a mega organizing session, take these steps first so you’re sure to make the most of your organizing weekend. 1. Make a list of potential projects. To me this feels like a pretty long list, especially when I consider that a year ago I felt like I didn’t have any organizing projects in my home. This, my friends, is what happens when you embark on a new organizing journey. You become so happy with one area of your home, that other places feel as though they need attention, too. Plus, as you hyperfocus on one space (hello my entire lower level) other areas don’t get the same maintenance attention they got before the big project. 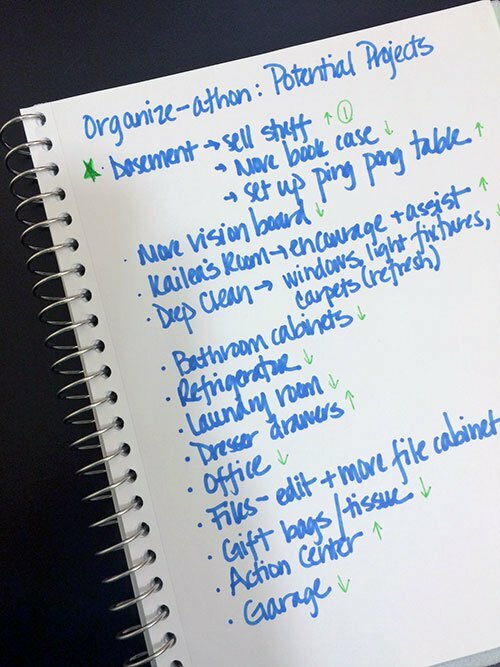 So, if you feel like your list is growing despite the fact that you’ve been working on organizing your home for a while, don’t feel discouraged. Instead, know you’re in good company, and take this as a sign that the Organize-athon just might be made for you. Okay, so there’s my list. What’s on yours? Once you make your list, move onto the next step. There are a lot of different ways you could prioritize your list. I offer a couple with the kick-off materials, but here’s one more. For each item on your list ask “How much is this bugging me?” I used a simple up arrow to designate “a lot” and a down arrow for “not too much.” If you need a more precise scale, you could assign a number from 1 to 3 or 1 to 5, depending on how precise you want to get. Don’t over-think this. Just pick a system and start prioritizing. 3. Pick a project to start with. Once you have your prioritized list, pick one project to start with. And trust me when I say “one.” Don’t overwhelm yourself by thinking you can knock twenty projects off your list during your Organize-athon. Maybe you can (and maybe you will) but your best chance of doing that are by focusing on just one project at a time. You can certainly keep your list handy throughout the weekend and choose your second project, just as soon as you finish your first. Oh and trust me one more time: you will be much happier with the results of your big organizing session if you finish one project than if you start more and finish none. With your project in mind, think through what supplies you will need to tackle your project. If you haven’t done so yet, consider setting up an organizing tool kit and / or container station so you have all the basics handy. Finally, clear your calendar so you can truly focus on your organizing project. You don’t have to expect yourself to organize non-stop all weekend long. In fact, I encourage you to schedule some breaks. I plan to go to bootcamp and take a few other breaks during my Organize-athon, but, it’s also important that you give yourself some uninterrupted blocks of time to make progress on your organizing project. Alright friends, all that’s left to do now is wait for the weekend! I wish that I could join, but I shall be on vacation. Next time. And happy organizing! Hi Cynthia! We wish you could join as well. Have a great vacation!